Fake text messages were sent out on Election Day. (CNN) - Voters in several states have receiving bogus text messages or e-mail urging supporters of Democratic presidential candidate Barack Obama to put off voting until Wednesday because of long lines, spurring threats of prosecution in at least two states. The messages - a perennial election stunt - popped up Tuesday on mobile phones and computers in the battleground states of Florida, Virginia and Missouri, as well as in several other states. One falsely claimed to be a "CNN breaking news" alert. 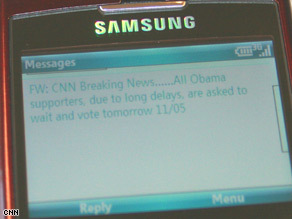 "All Obama voters, due to long delays, are asked to wait and vote tomorrow 11/05," that message stated. Election Day is a one-day event, of course - and in a statement issued Tuesday, Missouri Secretary of State Robin Carnahan said she had "no tolerance" for anyone attempting to confuse voters. "I am working with local election officials around the state to make sure poll workers and voters understand their rights," said Carnahan, a Democrat. "Anyone attempting to deprive voters of their rights on Election Day will be prosecuted." In Maryland, a spokeswoman for Attorney General Douglas Gansler said his office had passed along complaints about the messages to the U.S. Justice Department and state prosecutors. Similar messages were reported in Texas, Mississippi, Alabama, Maryland and Arkansas. In Virginia, hackers breached the computer network at George Mason University to send the message, university Provost Peter Stearns told students, faculty and staff in an e-mail denouncing the hoax. "I am sure everybody realizes this is a hoax," he said. "It is also a serious offense, and we are looking into it. Please be reminded that Election Day is today, November 4th." A flyer with a similar message was spread around the Hampton Roads area of southeast Virginia last week. Virginia State Police said Monday that they would not bring charges against the man who printed them, and state Board of Elections Secretary Nancy Rodriguez called the flyers "a joke that got out of control." People that do this, no matter which side, should be prosecuted to the fullest extent of the law with the HIGHEST possible punishment. This is basically attempting to deprive people of their rights and moral obligation as democratic citizens. I agree with Robin Carnahan, SOS in MO, they should be prosecuted. Joke, or no joke, this is a serious matter. Anyone attempting to confuse a voter which results in a vote not being cast should be punished. It doesn't matter whose vote was being thwarted, democrat or republican. Shame on those Americans who work for the parties who are encouraging this. And for Nancy Rodriguez to agree that it was a joke is outrageous. This is like saying the word "bom" or "hijack" on a plane, we can't let these things happen. All attempts to confuse voters or keep them from voting have to be taking seriously. typical desperate acts of a desperate party...i shake my head in shame towards THEM to know THEY have stooped to the lowest of the low. ALL american's through their actions, are gulity in the eyes of the world. Who would be dumb enough to believe such a scam? This reminds me of the guy who scammed suckers into buying pieces of real estate on the moon. My friend and I are Obama supporters and we recieved one, but it was for McCain. It was telling us to vote on wednesday for McCain. So it is not targeting Obama supporters. I think it was sent randomly to just everyone. I WANT TO SEE JAIL TIME FOR THESE PEOPLE. this is not a joke, I called cnn about this myself even in montana this kind of a stunt is being tried. CONVINCE PEOPLE OF YOUR POINTS AND BELIEFS DO NOT TRY TO TRICK THEM INTO LOSING THEIR CHANCE TO BE AN AMERICAN. TARGETING PEOPLE FOR POLITICAL REASONS IS TERRORISM. I got a phone call stated that they supporting Obama, and urged us to go to vote and told me that the voting place is at Harem Road. I have voted for many years at the same place at Liberty Road and never change. So I checked with the BOE in Delaware before I went to vote, it shows the same place at Liberty Road. I don't know what's going on here. You can always count on the Republicans to take the low road. Every Republican flier I received in the mail was a negative attack on the opposition instead of extolling thier own candidate's virtues. Guess they don't have any! I got one in my state telling me to vote for obama on a differnet line "it will count the same, just acknowladge a different party, vote for obama on the working family party line G" or something to that effect. on the sample ballot that line was just some total random schmo running for president for what i dont know why reason. Scam+ anything to win. dirty politics at its finest. The unfortunate thing is that people are so quick to believe almost anything they read. I still get the chain letters and obvious hoax emails from what I would deem "intelligent" people... It's like people turn their brain off when something is written down. The other unfortunate thing is that people who would likely believe the text are not CNN viewers or informed enough to detect the fraud.